20x200 is a great concept site. 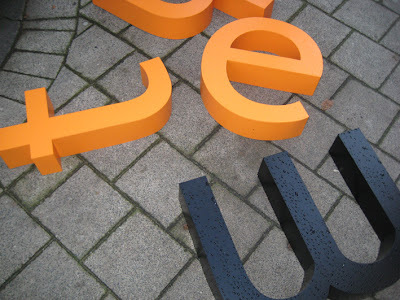 The idea is simple, 'large editions + low prices × the internet = art for everyone'. 20x200 introduce two new pieces a week: one photographic and one work on paper. 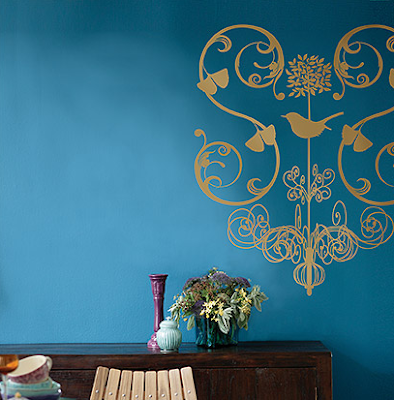 Each image is available in three sizes. The smallest size is reprinted in the largest batch – an edition of 200 – and sold at the lowest price – USD $20 / £9.70 / €13.50. Hence the name 20x200. They offer bigger prints for bolder collectors - medium-sized editions of 20 for USD $200 / £97.0 / €135, and large-sized editions of 2 generally for USD $2000 / £970 / €1,350 (some of the large sized editions will actually be original pieces of art and prices will vary a bit). 20x200 deliver every print with a certificate of authenticity numbered by the artist. 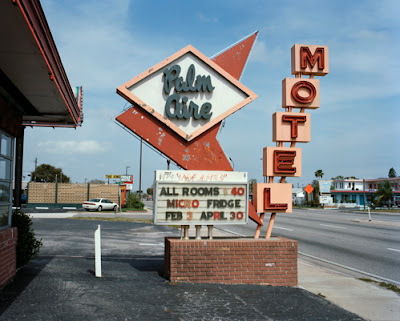 The photograph above is Palm Aire by Tema Stauffer. 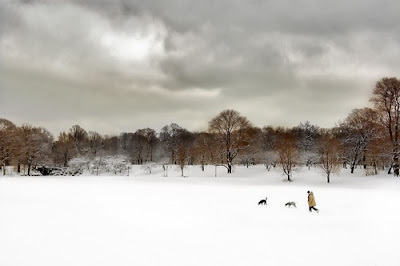 Prospect Park by Joseph O Holmes. 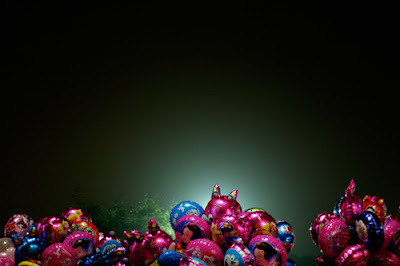 Untitled (Hanoi no.2) by Kelly Shimoda. 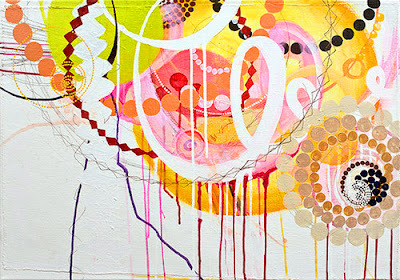 20x200 is the brainchild of Jen Bekman. Jen opened her pocket-sized gallery on the Lower East Side nearly 5 years ago with the mission of supporting emerging artists and collectors, and she's made a name for herself doing just that. 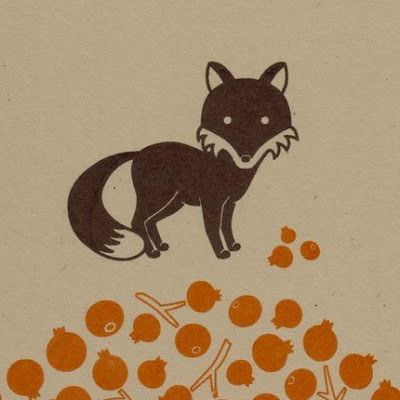 20x200 is a great way to get your hands on some modern art. 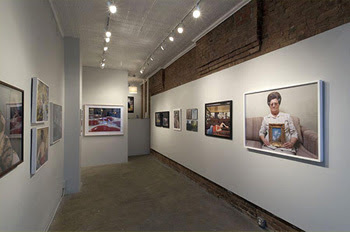 If you're in NYC, stop by Jen's gallery, 6 Spring Street, New York 10012. 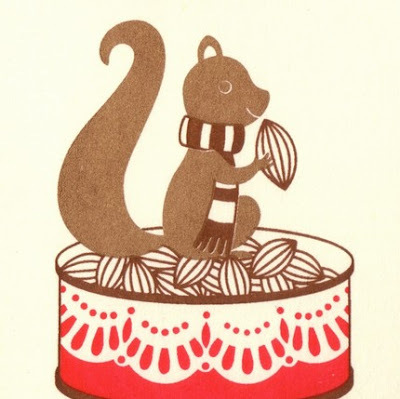 Open wednesday - saturday: noon - 6pm or by private appointment. 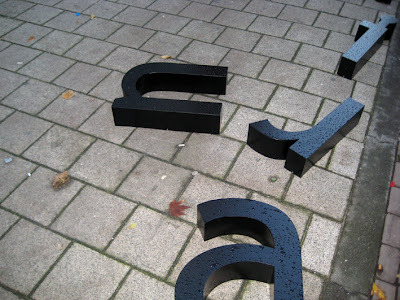 On the way home yesterday I came across these letters. Lying on the street waiting to be put up on a building, they were just lovely. 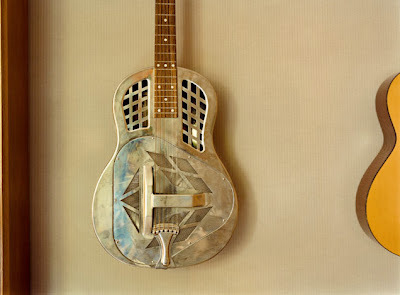 Ted Noten and his team make beautiful art and design pieces. 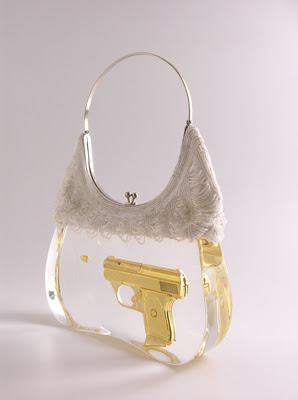 Lady-K-Bag, 30 x 22 x 8cm, engraved and heavily gold-plated gun and bullet, textile, chrome steel, 2004. 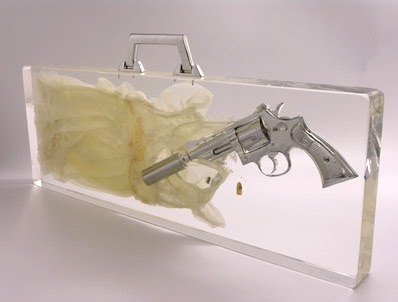 Murdered Innocence, suitcase 24 x 68 x 6cm (appr. 20 kilo) gun with a silencer, holy communion dress, pearl, diamond, bullet. 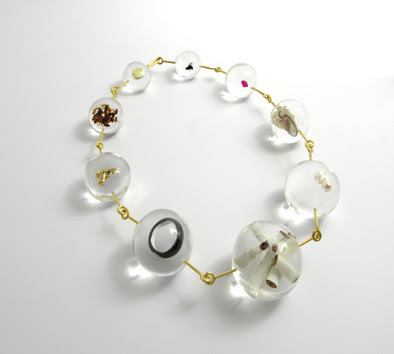 Ice Necklace. 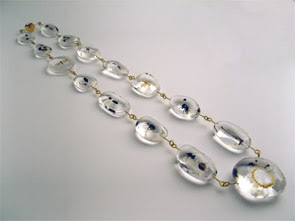 Inspired by the "Siberian Necklace" from the series Global Tactile Pieces Vol.2, new versions made from acrylic, 2007. Design Icon Rings, 925/1000 silver with engraved design icons, available online €1000 / USA $ 1,483 / £720. 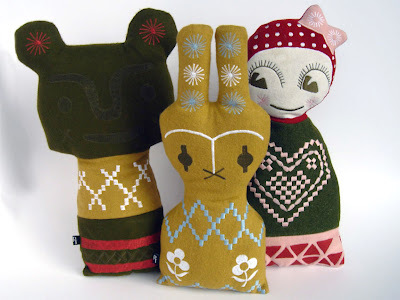 Here's a great Australian shop I've just discovered, Via Alley, who say their shop "is the result of an admiration for artists and designers who are proud of who they are, passionate about what they do, who are talented and are willing to give it their all to fulfil a dream". Kamon scarf by Keiichi Tanaami, of Kamon Design of Japan. 71cm square, AUD $80 / £35 / €48. 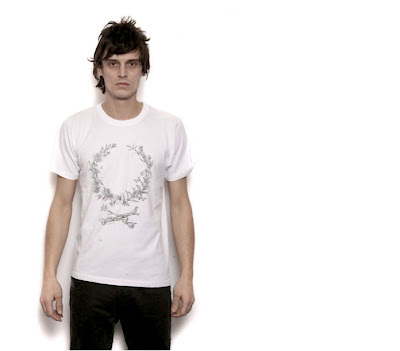 Classic Tee Shirt, Papillon by Surface To Air. Jersey print Papillon. AUD $110 /£47 /€66. New character, Rabbit, from Welcome to the Doll House, Princess Tina's 11th range. Approx 50cm tall. AUD $80 / £35 / €48. 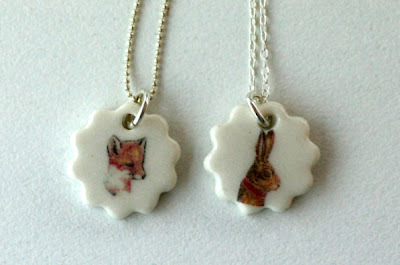 Fox or Rabbit necklace by Iggy & Lou Lou. 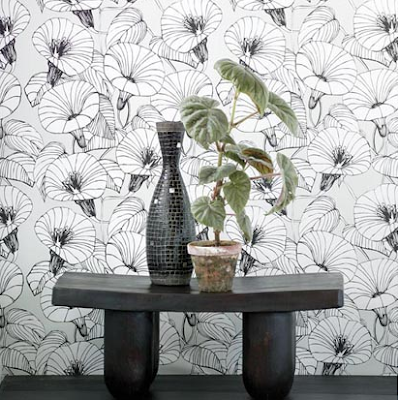 Each piece of the Iggy & Lou Lou range is handmade and draws on the rich and varied history of the porcelain medium. Charm size approx 2x2cm with sterling silver chain. AUD $60 /£25 /€35. Shop 2, 289 Liverpool St, Darlinghurst, NSW, Australia. 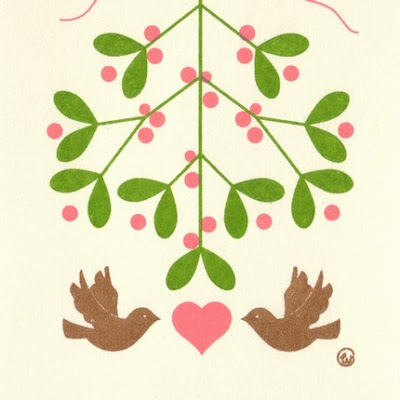 Open: Tueesday, Wednesday and Friday 12-6pm, Thursday 12 - 6pm, Saturday 11am - 6pm. Mon & Sun - closed, or by appointment. 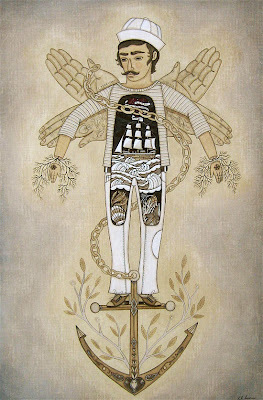 The Johansson Projects present a great new show by Evan B Harris and Lawrence La Bianca, 'Anatomy of Folklore'. 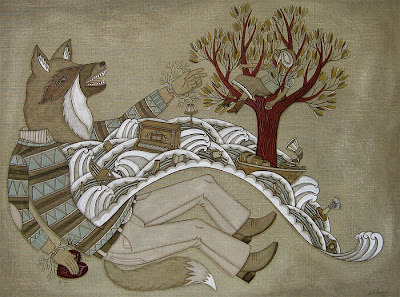 These works by Even make me so curious about the folklore that inspired them. 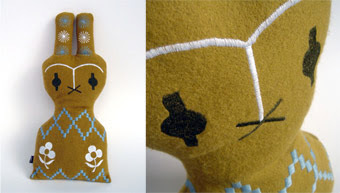 They're superbly magical with such fine and delicate detail. 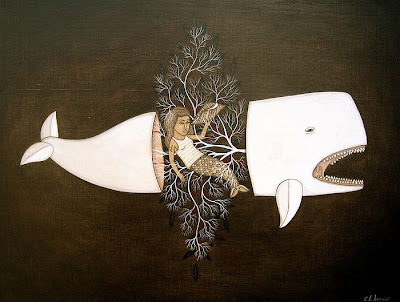 Above, White Whale and Shells, 18” x 24" / 45.7cm x 61cm, USD $850 / £413 / €570. 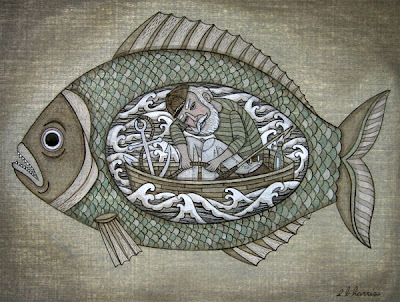 Fisherman's Fish, 12" x 9", 30.5cm x 23cm, USD $475 /£230 / €320. Redwood Waves, 30" x 24", 76cm x 61cm, USD $1250 /£607 / €840. 2300 Telegraph Ave, Oakland, California, USA. Exhibition runs November 15 2007 though to January 2008. Open Thursday - Saturday 12 - 6pm or by appointment. The Victoria and Albert Museum is my favourite museum in London. The V&A South Kensington is the world's greatest museum of art and design, with collections unrivalled in their scope and diversity. It covers everything from ceramics, furniture, fashion, glass, jewellery, metalwork, photographs, sculpture, textiles and paintings. And it's their textiles and fashion exhibitions that have me drooling. Earlier this year I was fortunate to see the Kylie fashion retrospective. Fantastic to see so many of her (tinsy tiny) outfits on display. 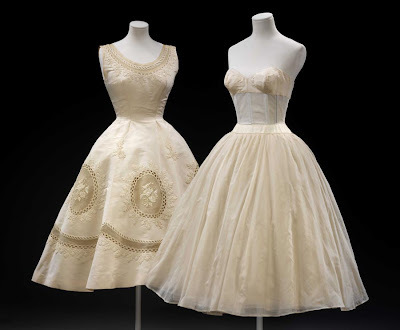 The V&A current exhibition is The Golden Age of Couture, Paris and London 1947-1957. I'd give my eye teeth to see this, but sadly don't think I'll manage it. However, lucky me received a beautiful surprise package from a London friend with a postcard book from the exhibition and I've been flicking through it lovingly almost every night since, thank you darling Miss Finn. 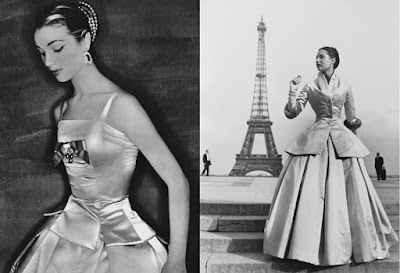 Left, 'Zémire' evening ensemble by Christian Dior, shown without jacket. Vogue (French edition), September 1954. Photograph by Clifford Coffin. Right, Ready-to-wear copy of 'Zémire' by Susan Small, silk satin. Vogue (British edition), November 1954. Shoes by Roger Vivier for Christian Dior. 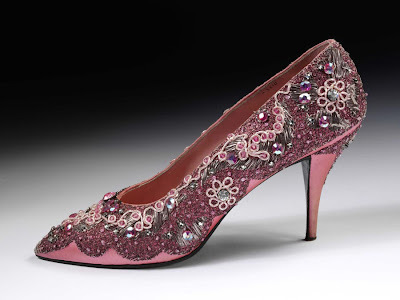 Pink satin embroidered with metal thread and sequins, Paris about 1958. And on the topic of shoes, the V&A have a Design a Shoe Competition. Shoes are an integral part of any fashion style, and this was particularly true during 1947-57. If you are inspired to create you own shoe design then you can submit your design to the V&A where it'll be judged by none other than Professor Jimmy Choo OBE. If shoes aren't your thing, you can also design a couture inspired dress. Advertisement for checkerboard patterned velvet and faille by Bianchini Férier, modelled in an evening dress by Dessès. 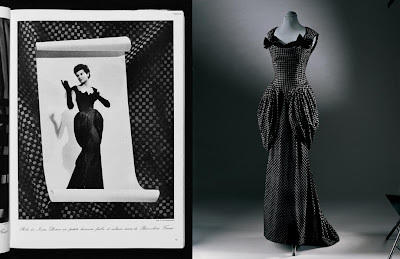 Vogue (French edition), October 1948 and the dress as it stands in the exhibition. Then there is this Miss Lachasse doll from a collection of fashion dolls created for a touring exhibition to raise money for the Greater London Fund for the Blind. She was based on Virginia Woodford, the leading model at the Lachasse couture house in Mayfair. The level of detail in her clothes and accessories is astounding. The V&A say that her wardrobe shows "...the clothes a typical couture client would possess. It includes lingerie, accessories and jewellery, made specially by exclusive London companies such as Asprey. It also has what is thought to be the smallest pair of nylon stockings ever made." 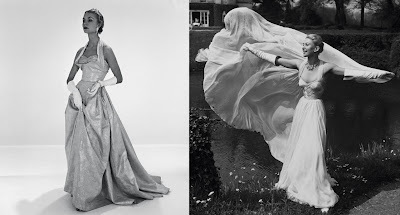 Left, photograph of a Coronation collection evening dress by John Cavanagh, with the silk designed by Oliver Messel for Sekers. London, 1953 spring/summer. Right, Photograph by Seeberger of evening dress by Jean Dessès. Paris about 1953. Dress and petticoat, Pierre Balmain, Paris. The V&A has many events and courses, so if you live in London take advantage of these extra activities. For those of us not in London, all is not lost. The V&A have a series of three short podcasts about the Golden Age of Couture have been produced to accompany this exhibition. 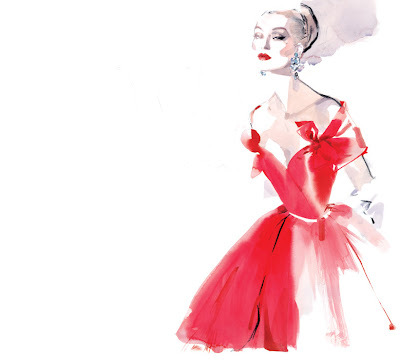 The podcasts feature interviews and insights from those involved in the world of couture. The Golden Age of Couture exhibition runs September 22, 2007 - January 6, 2008. Beautiful new watercolour & acrylic on paper works by artist Jen Corace from her new exhibition. 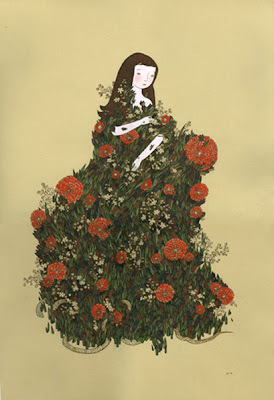 'I told you so' is Jen's current exhibition at gallery Giant Robot New York. These simple yet very quirky images look like they've come from some strange folk or fairy tale book. 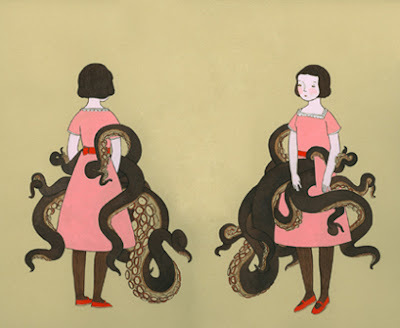 I love the colours and composition and the amazing tension she achieves in her groups of 1920's styled girls and encounters between her girls and beasts. 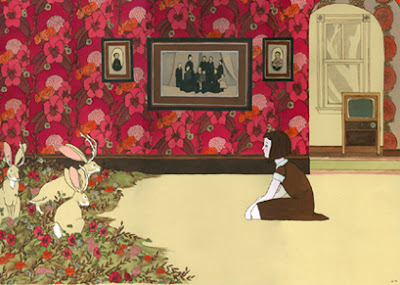 The antlered rabbits are fabulous. 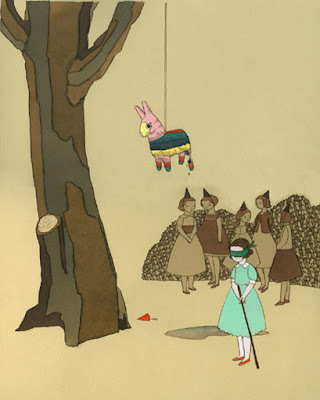 Pinata, USD $1,200 / £580 / €810. Sitting, staring, thinking USD $3,000 / £1,450 / €2,020. And my personal favourite... You, me, sold - to me! I just impulse bought this piece! I do so love it... weird, but fabulous. Art is good for girls. 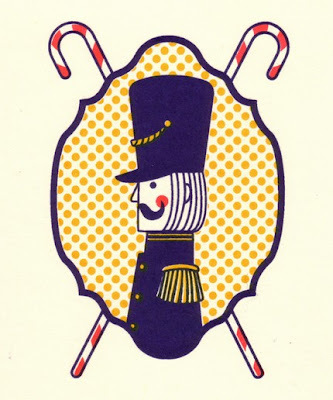 The exhibition runs November 17 - December 5. GRNY, 437 East Ninth Street, NYC, 1009. Open Monday - Thursday 1 - 8.30pm, Friday - Saturday 12 - 9pm, Sunday 12 - 7pm. 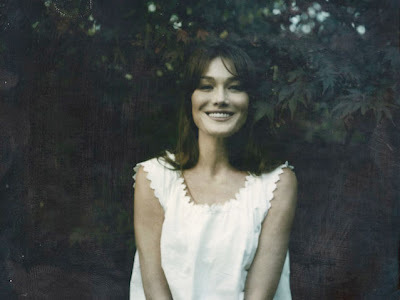 If you haven't had the pleasure to date, let me introduce you to Carla Bruni. Italian-French model, turned singer-songwriter and poet. What a package, eh? Her website has an interesting navigation and is jam-packed with information, pictures, song samples and more. 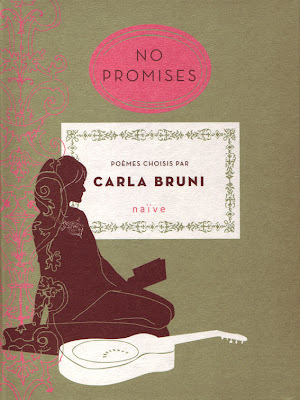 Carla has released two albums to date, Quelqu'un m'a dit, in 2002 and No Promises, in 2007. She's also released a book of poetry to compliment her last Album of the same name, No Promises. I had no idea this book existed until receiving it the post from my gorgeous 'brother' Shane. What a treat! It's beautifully designed and make me want to learn French, thanks, darling. 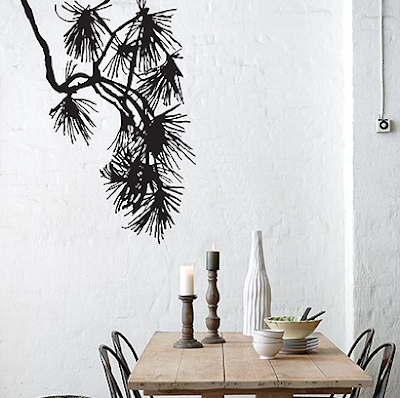 Lovely wallpaper designs and wall decals by Fern Living of Denmark. 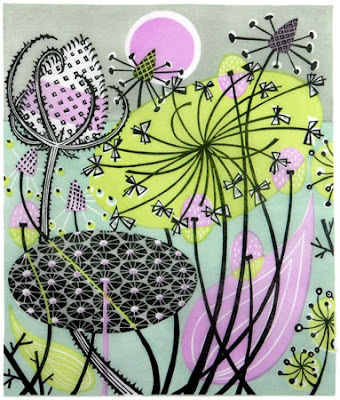 Alliums, linocut, image size (mm):220w x 265h, edition: 40, mounted print £165 / €230 / USA $336. 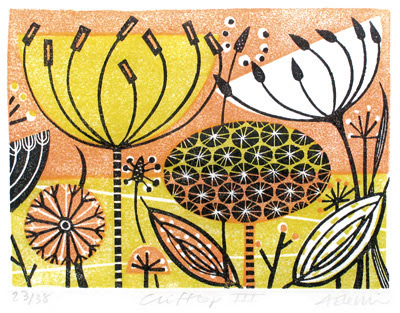 Speypath III, linocut, Image size (mm):395w x 310h - Edition: 40, mounted print £220 / €307 / USA $448. Clocks II, wood engraving, no longer available. 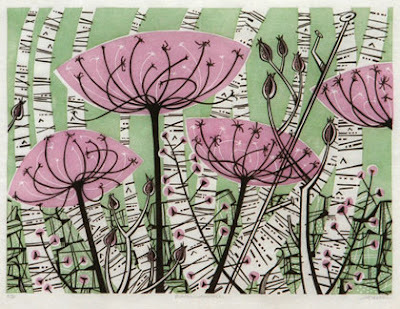 Ballindalloch, linocut, no longer available. 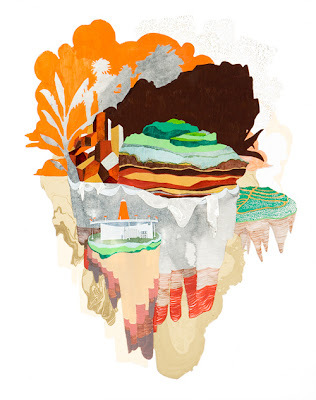 Clifftop III, wood engraving, image size (mm): 90w x 70h - edition: 38, mounted print £105 / €146 / USD $214. 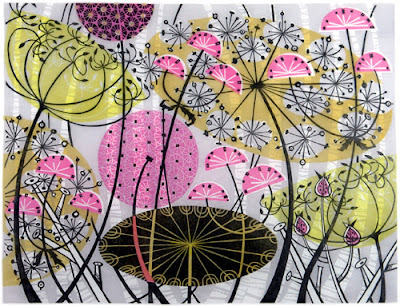 And branching out, some of Angie's prints have been applied to these beautiful textiles from St. Jude. 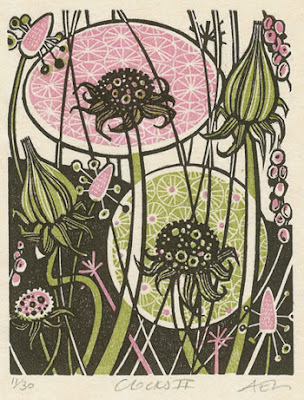 I love the retro feel of the patterns and colours, really stunning.